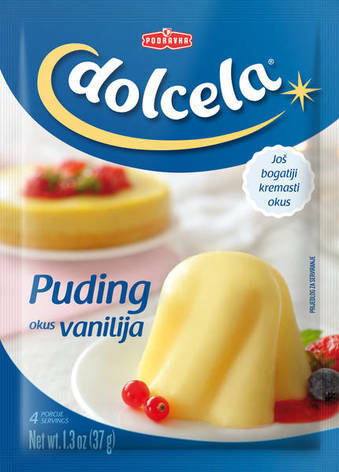 Vanilla pudding, classic among puddings, is ideal as a stand alone dessert, but also can serve as a basis for various desserts, combined with fruit, biscuits, nuts or simply decorated with whipped cream foam. Contains corn starch,which is a natural source of carbohydrates. Only natural colours added. Instructions: Combine pudding mix with 3 tablespoons (40 g) sugar. Of ½ L cold milk, take 6 tablespoons and add to pudding and sugar mixture, mix well. Cook remaining milk, remove from heat and add in pudding mixture, and cook an additional 1 – 2 minutes, while stirring.... show more Instructions: Combine pudding mix with 3 tablespoons (40 g) sugar. Of ½ L cold milk, take 6 tablespoons and add to pudding and sugar mixture, mix well. Cook remaining milk, remove from heat and add in pudding mixture, and cook an additional 1 – 2 minutes, while stirring. Pour hot pudding into damp dishes and leave to cool. When done garnish with whipped cream "Dolcela", chocolate decorations, fresh or candied fruit, fruit syrup, juice or compote. Ingredients: corn starch, flavouring (vanillin), table salt, colour (beta-carotene).